Kalamurina protects a vast area of desert in the heart of Australia, on the shores of Kati Thanda-Lake Eyre. It encompasses the junction of three major rivers and a diverse mix of habitats, providing refuge for a range of desert wildlife. Kalamurina is a vast desert wilderness, covering a remarkable 679,000 hectares (nearly 1.7 million acres) at the intersection of three of Australia’s central deserts: the Munga-Thirri-Simpson Desert, the Tirari Desert and Sturt’s Stony Desert. The acquisition of Kalamurina linked Kati Thanda-Lake Eyre National Park and the Munga-Thirri-Simpson Desert Reserves, creating a contiguous protected area larger than Tasmania. Spanning over 140 kilometres from east to west, Kalamurina features vast, spectacular dunefields, a network of freshwater and saline lakes, riparian and floodplain habitats and small gibber plains. It provides refuge for a diversity of desert wildlife including the Crest-tailed Mulgara (Ampurta), the Dusky Hopping Mouse, the Eyrean Grasswren and the regionally endemic Lake Eyre Dragon. Kalamurina captures a large and ecologically significant area of the Kati Thanda-Lake Eyre catchment, where three of central Australia’s most important rivers converge to form an intricate pattern of habitats. Over 65% of the water that enters Kati Thanda-Lake Eyre travels through Kalamurina. The Warburton Creek is the major source of water for the Lake, with its origins in the Channel Country of Queensland. The water takes around a month to travel 1,000 kilometres before meandering through Kalamurina in the Warburton Creek. It converges with the Macumba River and Kallakoopah Creek before flowing into Kati Thanda-Lake Eyre, the largest lake in Australia. The Kalamurina section of the Warburton Creek is the only stretch of this nationally significant waterway that is managed for conservation. The creek only flows about every two years, with major floods that provide water to Kati Thanda-Lake Eyre occurring only every 5-10 years. In places, the floodplain is several kilometres wide. Major floods create a dramatic splash of green growth through the middle of the desert, attracting waterbirds from across the continent. The climate on Kalamurina is harsh, with an annual average rainfall of less than 150mm and summer temperatures that regularly exceed 45 degrees Celsius. Large claypans are scattered across the landscape, ranging in size from a few hectares to several thousand hectares. These pans (or lakes as they are called) are briefly inundated after rare local rainfall. Much of Kalamurina is characterised by spectacular dunes that stretch from one horizon to the other. Some dunes run continuously for over 20 kilometres, are up to 18 metres high and can be 100 metres wide at the base. Dunes on Kalamurina are both red and white, whereas elsewhere in the Simpson-Strzelecki Deserts, the sand dunes are a deep red. On the eastern side of the sanctuary, the elongated dunes are in a parallel series oriented to the north-northwest. On the western side, the dunes have branched out and reconnected to form an irregular pattern. Kalamurina contains a diversity of ecosystems – vast dunefields, a network of freshwater and saline lakes, desert woodlands, gibber plains, and riparian and floodplain habitats. In the dunefields, local rainfall supports thinly scattered Sandhill Canegrass communities which contain small shrubs like Saltbush and Velvet-leafed hibiscus. Some dune flanks also support areas of tall open shrubland consisting of widely separated wattles and Hakea. Where dunes are widely spaced, clay soils are exposed, and you will find chenopod shrubland composed of grasses, Saltbush and Bluebush, Acacia, and Eremophila. The floodplains of the Warburton, Kallakoopah and Macumba RIvers support narrow corridors of Coolibah and Lignum woodlands and shrublands, with Acacias, Saltbush, Groundsel and grasses. Except for algae during floods, the salt lakes are unvegetated, but their shores support open shrubland of samphire, Frankenia, Nitrebush and Saltbush. 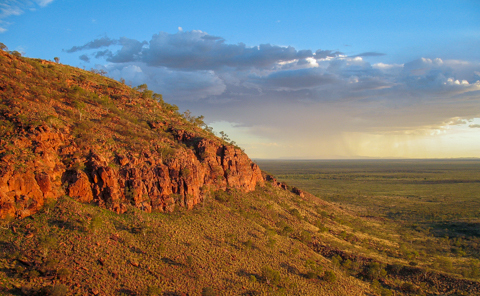 Kalamurina also contains a small area of gibber plains. Australia has the worst mammal extinction rate in the world, and the geographic focus for many of these extinctions has been central Australia. The region around Kati Thanda-Lake Eyre was once home to species such as the Lesser Bilby and the Pig-footed Bandicoot, mammals that are now presumed extinct (the last evidence of a Lesser Bilby was collected in the 1960’s in the Munga-Thirri-Simpson Desert). 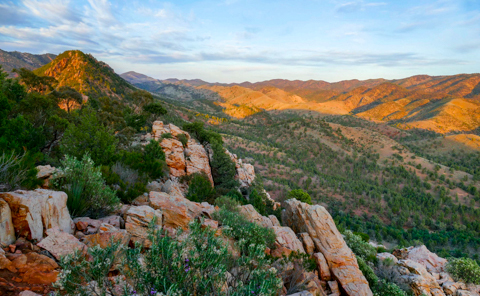 Kalamurina remains a stronghold for several threatened and declining mammals including the Crest-tailed Mulgara (Ampurta), a small carnivorous marsupial. It is common on the property, living in burrows among the sand dunes and emerging at night to hunt. There are Dusky Hopping Mice on Kalamurina, as well as the Kultarr and possibly the Kowari (other small mammals). The wildlife of Kalamurina is most dramatic in times of plenty, after the Warburton has flooded. Native Long-haired Rats arrive in massive numbers, attracting predators including the Letter-winged Kite, Australia’s only nocturnal raptor. Tens of thousands of waterbirds – pelicans, ibis, spoonbills, waders and many species of duck – congregate along the Warburton Creek floodplain, as the life-giving floodwaters make their way towards Kati Thanda-Lake Eyre. The iconic Eyrean Grasswren (rediscovered on Kalamurina after it had not been seen for more than 50 years) and the cryptic Grey Grasswren are two highlights of the bird community on the property, as well as Red-capped Robins, Cockatiels, Budgerigars and Orange Chats. There are also at least 50 reptile species at Kalamurina, including the Woma Python and the Desert Skink. Land management at Kalamurina is informed by scientific data collected on AWC’s regular surveys, and is mainly focused on the reduction of feral animal numbers. 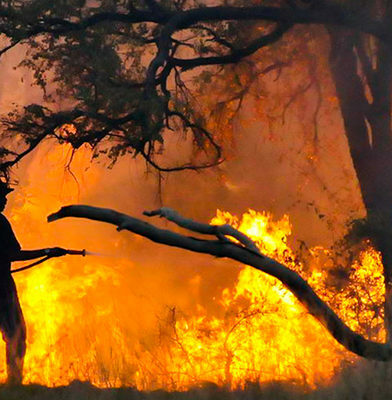 Fire is not a significant issue on the property, as Kalamurina has very little Spinifex, and the majority of vegetation is sparse enough to ensure that fire will not carry across the landscape. 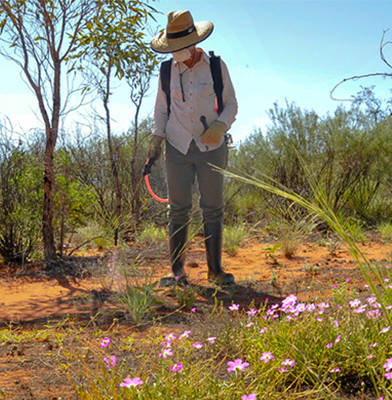 Unusually for central Australia, Kalamurina is also effectively weed free. Weed control mainly consists of quarantine measures and monitoring the floodplain for weeds transported in by floodwaters. Feral cats and foxes are a major threat to wildlife in Australia, and Kalamurina is no exception. We are unable to bait for feral predators on the property as we have a local population of Dingoes that are an important ecological driver in desert ecosystems. AWC has sponsored a PhD research project on the ecology, movements, habitat use and diet of Dingoes on Kalamurina. We are also undertaking research across our sanctuaries to develop an effective landscape-scale method of control for feral cats. AWC is working to reduce the density of feral herbivores on Kalamurina through a dedicated annual program of shooting. In 2018 alone, AWC removed 62 camels from the property. Rabbits are a major threat to the ecosystem, so as well as shooting, AWC is conducting trial releases of calici virus and destroying rabbit warrens. There are low densities of feral cattle, which are mustered as required. The ecological survey effort at Kalamurina currently spans 33 permanent study sites covering all the major habitat types on the sanctuary, as well as another 60 sites which provide a standardised sampling methodology for comparative bird surveys. The surveys take place every three to five years (more frequently in response to significant weather events) and involve almost 4,000 live trap nights, 200 camera trap nights, over 150 bird surveys, as well as vegetation surveys and sand plot track analysis. 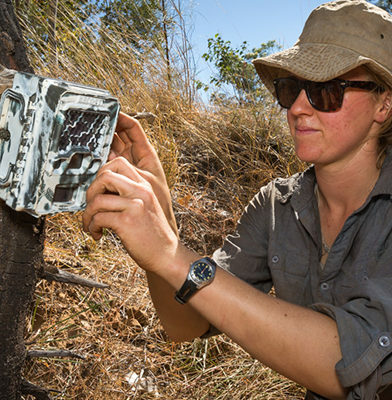 The data from this research measures a suite of ecological health indicators, including the diversity and abundance of key faunal groups (threatened mammals, seed-eating birds, diurnal reptiles) and the impact of key threats, and allows AWC to track the ecological health of Kalamurina. Australia has the worst mammal extinction record in the world. A large contributor to this has been the introduction of feral animals, particularly foxes and cats which prey directly on native wildlife. 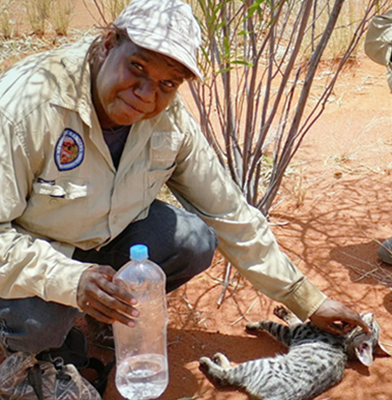 At Kalamurina, AWC staff remove as many foxes and cats as possible, and also protect the local dingo population. We are conducting research into the role of dingoes as an apex predator in arid environments, and working to develop a landscape-scale method of controlling feral cats.